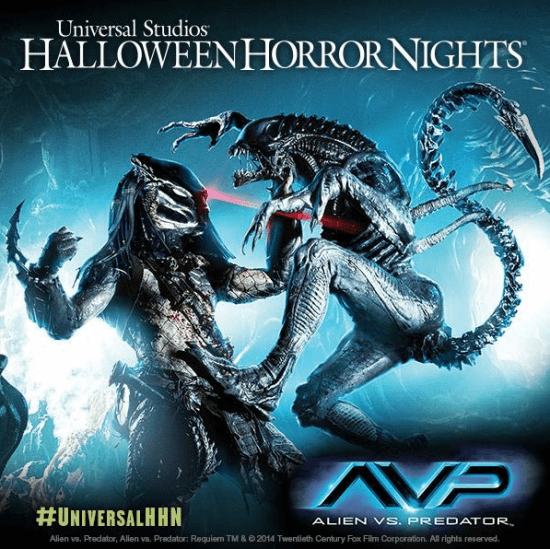 The best new experience at Universal Orlando’s Halloween Horror Nights 2014 is easily the “Alien vs Predator” haunted house. Combining two classic, beloved film franchises into one high energy maze produces an exhilarating walkthrough experience. The haunted house is definitely more “Alien” than “Predator.” And it’s not so much “versus” as having both species attack Horror Nights guests around every turn. There are puppets, animatronics, projections, and many more special effects that make the Alien creatures believably come to life, while the Predators are simply big guys in excellent costumes. As the best house of this year’s event, it’s one of the mazes Universal Orlando has allowed us to show you via the video below. It’s not a 100% complete walkthrough, as we don’t want to ruin all the surprises, but you will get a good idea of how intense this experience is. But, but... that's my house! This looks to be one of the best haunted house events to date! I wanted to go to this too in California hopefully they will have it every horror nights every yr. I believe this is second time for the walking dead i haven't watch that but i might when i get the chance.Nice vid they did a good job i don't scream in places i laugh one time i went to house of horrors in california they had Van helsing like the werewolf and stuff they had Chucky i was laughing i was enjoying it.